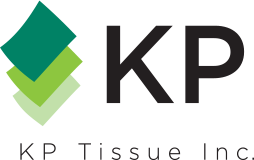 KP Tissue Inc. is a publicly traded company that currently holds a 15.7% interest in Kruger Products L.P., the operating company. KP Tissue trades on the TSX under the "KPT" ticker. Kruger Products L.P. is Canada's leading manufacturer of quality tissue products for the Consumer market (Cashmere®, Purex®, SpongeTowels®, Scotties®, and White Swan®) and the Away-From-Home market, and continues to grow in the U.S. Consumer tissue business with the White Cloud® brand and premium private label products.